*NEW & IMPROVED* We are continuously listening to rowers' experiences with our RoWedges and striving for a perfect product! The ORIGINAL, ONE & ONLY shoe size reducing insert. Hugely popular and hand made in the UK by rowers, for rowers. Transform your outings from under £6.50/ pair. You wouldn't run a marathon in shoes that were too big, so why put up with it in a boat? RoWedge is transferable, meaning that whatever the boat, whatever the shoe size, you can be confident in having a pair of shoes that actually fit. The RoWedges are supplied as a pack of 2 pairs. One pair will reduce your shoe size by 3 UK shoe sizes, the other pair will reduce your shoe size by 4.5 UK shoe sizes. We think you'll agree that it was about time that there was a cost effective solution for you- the rower, to the problem of clubs putting 'one size fit's all' shoes in their boats. 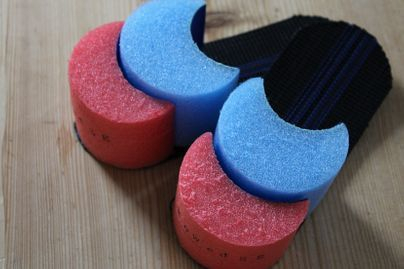 Simply combine the two using a tiny square of Velcro (supplied) to reduce your shoes by 7cms! FEEDBACK... We'd welcome yours too! "Can't believe how much better it has made my every day outings!" "Felt really different and straight away noticed an improvement in our connection at the catch"
"So far not much compression of the foam - I don't feel like I have much weight going down through them as it just gets my foot to a better place in relation to the footplate"
"The biggest benefit is that now when using the steering foot I only need to make small adjustments to my toe angle, whereas before I was contorting my whole leg trying to get enough movement with my heel way down in the bottom of a floppy shoe"
"Thanks for thinking up such a useful product! It seems like such an obvious problem to fix, but it's amazing what you put up with when rowing club boats until someone else comes up with the solution"
Please make it clear on your order if you'd like both pairs the same size. Please note that due to high demand there may be a slight waiting time. We will aim to get your RoWedge's to you within 7 days of receipt of order. If you don't have paypal, or for orders of more than one pack please email sculling@hotmail.co.uk and we'll email you an invoice by return. Remember to add your address to the order! THANK YOU!